Throwback: he liked it and put a ring on it. I wrote this two years ago. This is the story of how I got engaged. As you can see, I was a much more lengthy writer back then. It was a fun read for me. Hopefully you will enjoy it as well! I have gotten to know so many new people since then, so this is a good insight into my 20 yr. old mind. Take a read. So…. I’m about to tell you a story. On February 28th, 2014, after pleading with my cute boyfriend to come to Utah with me and being remarkably unsuccessful, I left early in the morning with my best friend Presley to go wedding dress shopping. (Yeah, tell me how messed up that is! I wasn’t even engaged.) We were looking real grungy and rough. We laughed and almost fell asleep but we did make it to Utah. After our 4 hour drive, we arrived, showered, beautified, and ate a couple grapes and a cheese-stick. Then, it was on to wedding dress extravaganza. I was less than thrilled to do it on my Friday night. I hadn’t heard from boyfriend all day because he was doing work. The second place we went that night was pretty good. I had a consultant named “Cortney”, yes, exact spelling and everything. She was great. I also realized, that I liked how I looked in a lot of dresses. That added to my stress. I finally made a decision on one dress, but when we left my sister, Brandice, assured me that we would have to look at at least two more places the next day. I was depressed as we drove home. I hadn’t heard from CJ and basically I was irritable. We got some JDawgs which helped me perk up a little. We danced with my niece Eily, which made me feel way better. CJ called, I was stressed out, but content. I woke up feeling really miserable on that Saturday. I generally pride myself on being really happy at least 90% of the time. Not that day. I was about to burst into tears before we even left. I felt strange about my body and my looks (girls, who’s with me!?) I missed CJ. 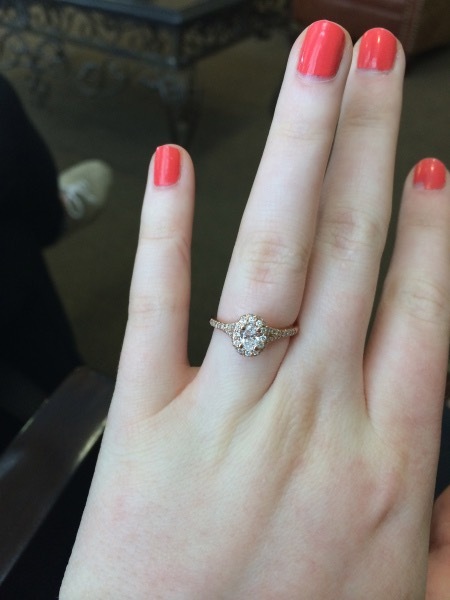 I felt like it was dumb to be shopping for a wedding dress when I wasn’t even engaged. So, we went to the first place. I felt like the lady wasn’t listening to me, despite her bright red hair. I felt like everything was not very flashy, pretty, or cool. Then she did something different and I loved it. I loved that dress. It’s to die for. Nothing I really expected myself to like, but it was gorgeous. The gasps from my two sisters, sister-in-law, and friend seem to help add to the effect. Moral of the story, we left. I was told that we at least had to go to one more place. I pleaded not to. I started crying. CRYING. I don’t even really make a habit of crying, but I couldn’t stop. CJ told me about how we would have to change our wedding date. The temple was closing on the date I wanted… What’s that? Yeah. I cried again. They went to lunch while I cried in the car. I came in late, started crying again. I have no idea what was wrong with me. I couldn’t control it. Brandice and Haley felt the need to buy me a phone case to make me feel better. 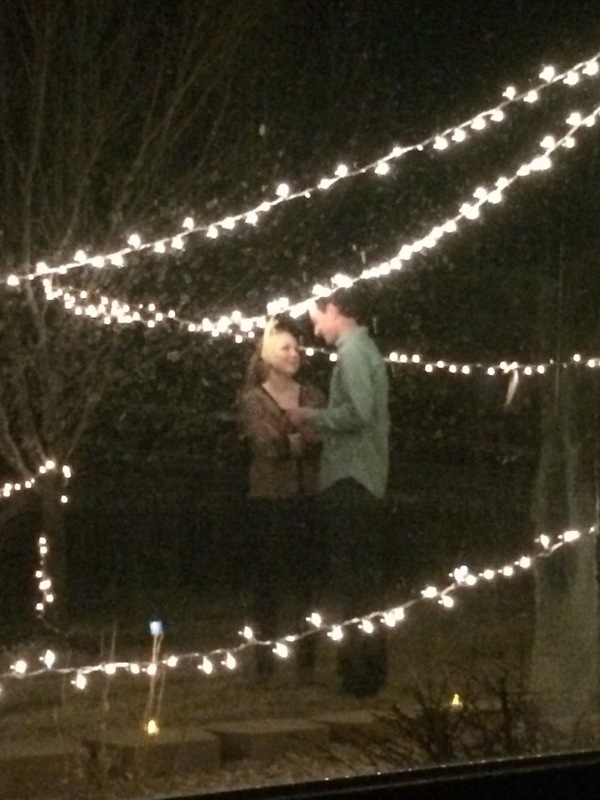 Amidst all of this, I kept complaining about how I shouldn’t even have to do this because I wasn’t even engaged. I was forced to go to another place. Haley left early for work. None of the dresses were that amazing to me. They told me we could go shopping at City Creek. Brandice and Presley convinced me to get my makeup done at a makeup counter which seemed really strange. I did it though. Presley and I looked a little rough afterwards. At this point, everyone abandoned me. I was depressed and drove home ready to eat some food, maybe put on a face mask, paint my nails. You know, the usual. Haley called and said she came home from work. I told her I was coming. She said to go get some doritos because we were having mac and cheese (weird combo, right?) Anyway, I told her I would be home soon. She told me to take the back way to the house because everything else was blocked off. I did. I arrived home put my hair in a ponytail before I got out of my car. I then got out and started to grab all the things people had left in my car (including doritos.) As I was about to lock my car, someone yelled, “HI!” I knew the voice and the face of that good-looking boy. I instantly replied with, “What are you doing here!? You’re crazy.” He then walked to me and said, “Let’s go for a walk.” I placed all the things that I had so carefully pick up, back in my car. I agreed reluctantly. 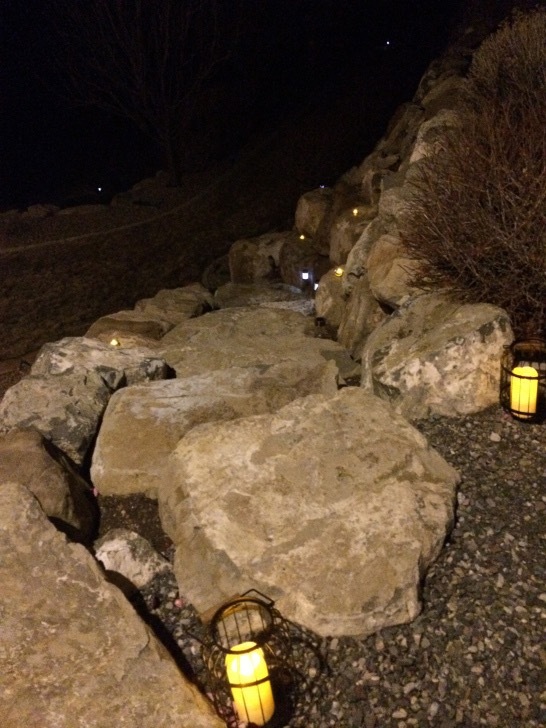 We walked down the stone steps to the backyard which had candles and a couple lanterns along the sides. By then, my knees were shaking and I was getting a little worked up. I was wearing talls wedges and was worried that I would fall. He helped me down the stairs, as I kept telling him, “Please don’t let me fall.” He assured me that it would be OK. Once we were all the way down the stairs, it was apparent to me what was going on. There were lights strung up across our trees. When the last slip of paper was read to me, it said, “On March 1st, 2014, you got engaged.” He struggled getting the ring box out of his pants as I laughed. Then, he got on one knee and did the deed. After I screamed, “YES!” and flung my arms in the air, we hugged. 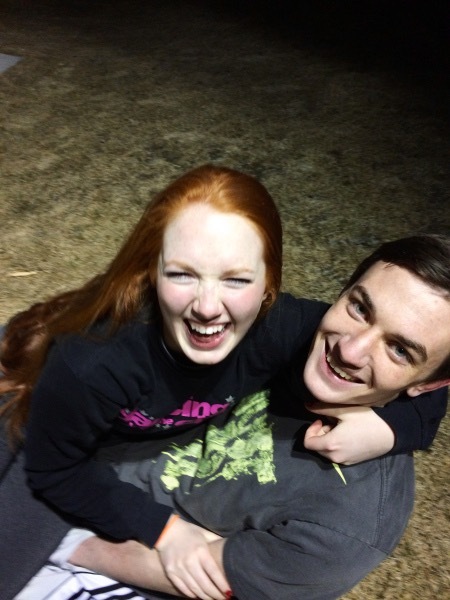 We actually told each other that we loved one another at the exact same time which made us both laugh. He brought me upstairs after I had agreed to be his wife and I was consumed and thinking about how I needed to look at my ring, because I hadn’t even looked at it before he proposed. Which is silly, because when we first started dating for some reason we made a contract that if we were to get married he had to follow. One of those stipulations was that the rock had to be “fat” or I’d say no. When it came to it, I actually didn’t care at all. I was ready just to relax and think about what had just happened because I was still in shock. The house was empty and the lights were all off. I took off my shoes and wondered why no one was there to congratulate us. 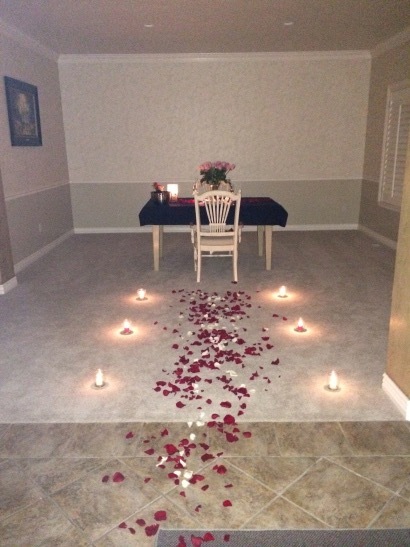 It all made sense as I noticed the candles and gorgeous rose petals scattered everywhere. I sat down to Martinelli’s on ice(Haley’s favorite part of my engagement) and a cute plate that said, “Mrs. Agren” on it in gold writing. 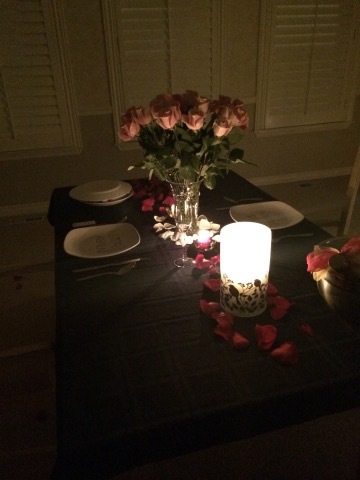 There were gorgeous pink roses on the table and more candles everywhere. I wondered what the heck we were going to eat. He pulled out our favorites from taco bell. Which is utterly hilarious, because we both are obsessed with taco bell. He gets me it all the time and it’s just kind of our thing. Anyway, I was too shocked to eat for awhile so I just kind of sat and stared at him. CJ looked at me with concerned eyes and wondered if I would recover from the shock. Basically, we kissed a few times. We danced a little. We prayed over our taco bell together. I stared at my ring. He stared at me. I stared at him. We walked around temple square. We danced and I walked on fountains at City Creek. It was perfect, cliche as that sounds. I just really love that guy. Sorry it’s not super mushy or intense about how much I love him. I think you should probably realize that if I decided it would be OK for me to be his wife. I’m grateful for the better person he makes me and how happy I am while in his company. I can’t say that he’s anything that I expected but I am so grateful that I got him. And I’m too selfish to let anyone else have him. I’m also really thankful for the great engagement he planned. It was better than the movies probably, but just remember that it’s shocking when it happens. Haha. Ok. That’s all. 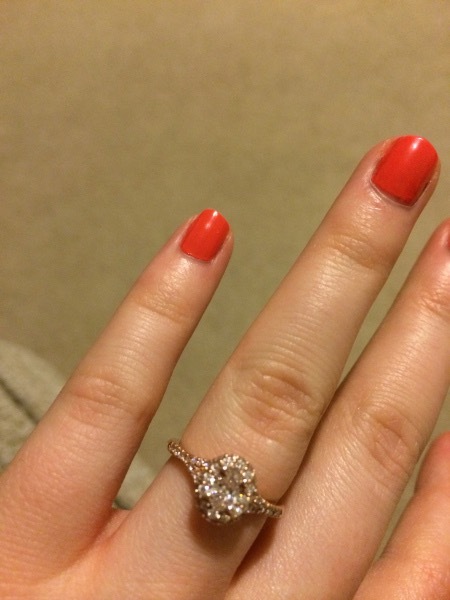 Such a great engagement story! Glad you two fell in love.